Is there a statute of limitations on SPOILERS? I feel like if a movie has been out in the world for, oh, say, fifty-two years, that it might maybe be okay to discuss the big "twist" without fear of ruining it for everybody. Particularly a movie like Carnival of Souls, which has been in both the public domain and also the Criterion collection for quite a while. 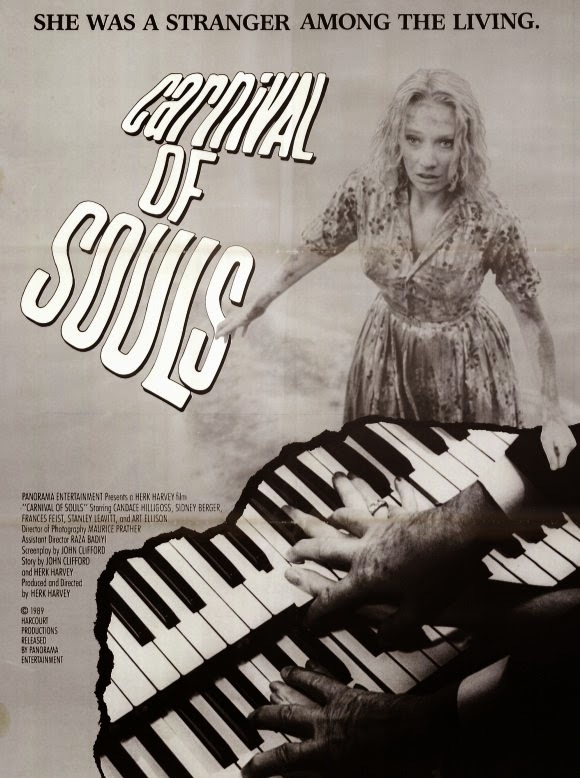 I know that a lot of you have probably heard of the film but maybe haven't seen it, but there's no point in writing about Carnival of Souls this late into the game without discussing what makes it so unique for its time. And that means directly addressing the end of the film, when the creeping sense of unease finally overtakes you. So here's what I'm going to do: consider this your SPOILER warning, because I'm diving in. The Blogorium has been around too long not to have included Carnival of Souls, and the Cap'n isn't going to shy away from twists and turns. Continue at your own risk if you haven't seen the film (and you should). Still with me? All right, let's get into it. I've always found Carnival of Souls has a lasting effect particularly because it's such an unorthodox "ghost story." Astute viewers of today can no doubt figure out that there's no way Mary (Candace Hilligoss) survived the car crash and somehow emerges from the river, to the surprise of the rescue crew and onlookers. We know, in fact, that she didn't at the very end of the film when the tow truck pulls the car out and her body is next to the other two girls, but it raises the question: what is the rest of the story? Is it a dream in the moments before death? Does her spirit escape, and try to carry on as before, only to be pursued by the spirits of the dead? She interacts with other people who are very much alive, who have scenes that Mary doesn't appear in, including the next to last moment at the carnival. In most horror movies - and certainly all of the great ones - atmosphere is key. Carnival of Souls excels at atmosphere, in particular the way that the mundane world Mary settles into is interrupted by phantoms who follow her at every turn. Arguably, the use of organ music is a dead giveaway when the shift is going to happen - which is forgivable, considering that it isn't nearly as egregious as, say the "monster" theme from Creature from the Black Lagoon. The organ music is also unsettling at times, as it too straddles the line between the sacred and profane. That it is Mary's chosen profession is all the more appropriate considering the trajectory of Carnival of Souls. There's something to the phrase "spiritual insouciance" in the IMDB synopsis - there's something to the idea that Mary refuses to die that makes the deliberately dreamlike second half of Carnival of Souls so alluring. She skips town, takes a job as an organist at another church, but is constantly drawn to the dead, the abandoned, the profane. The moments when she "ceases to exist" are really quite something, especially for 1962 (remember, this only two years after Psycho, and Mary dies even sooner than Marion Crane). Carnival of Souls has an illusory quality, juxtaposed with the very normal world of working and having a landlady and fending off your randy neighbor. Mary is torn between two worlds - one she's desperately trying to avoid - and the matter of fact shift between one and the other gives the film a kind of proto-Lynchian vibe. It's not entirely clear where Herk Harvey and John Clifford are heading with the story. Many ghost stories have characters who interact with the dead, but the protagonist is often alive or, in the case of something like The Sixth Sense, has a spiritual guide who is alive that introduces them to the world of the undead. Mary is our main character, and most of the film is told specifically from her perspective. She's haunted by the "The Man," (Harvey) who she attempts to avoid everywhere except at the carnival, where she's inexplicably drawn. It's there, after all, that she (and the audience) is revealed the truth - during their dance macabre (sorry, I couldn't help myself), The Man's partner is none other than an equally ghoulish version of Mary. She runs, they pursue her, she disappears. Which makes sense, but the following scene, when the Minister (Art Ellison), Dr. Samuels (Stan Levitt), and the police go to the carnival the following day and trace her footprints out to the water, where they stop. It's not the first time we've seen Dr. Samuels or John on camera without Mary in the shot, so there's some argument to be made that this represents objective reality, and yet they considered Mary to be a living, breathing person among them. In that respect, Carnival of Souls differentiates itself from films both before and after that deal with ghosts, poltergeists, or the like. It's reminiscent of the story of the woman in white, hitchhiking to the dance she never lived to see, but on a larger scale. This ghost refuses to believe she's dead - not in an ignorant way (like The Sixth Sense), but in a determined sense to stay alive. On some level, Mary knows she's deceased - her attraction to the abandoned carnival (filmed at the abandoned Saltair Pavilion outside of Salt Lake City) is linked to the idea of something (or someone) existing past their purpose. She intermittently flirts with John Linden (Sidney Berger), her neighbor, alternating between a need for human contact and some distant understanding that he has nothing to offer her. Mary's destiny is with The Man, her partner in the dance of the dead, if I may drop all subtlety. Her at times inexplicable behavior is much clearer at the end, when it's obvious that these are the last whims of a dead woman, one who slipped free from the afterlife. For a little while, anyway. To this day, Carnival of Souls is best viewed late at night, when the mind begins to wander, and when its dreamlike logic is more effective on viewers. That, at least, is how I prefer to introduce it to people. Its influence stretches far beyond its familiarity with most audiences - one will be hard pressed to find people who haven't heard of it, but many of them still haven't seen it. It's presence in the public domain no doubt muddies the water - along with Night of the Living Dead, Carnival of Souls can be found bundled with any number of cheapie monster flick from the 1950s and 60s, doomed to be downgraded by association, a fate a film this good doesn't deserve. It's somewhat amazing that this is the only feature Herk Harvey ever made, but if you're only going to make one, we should all hope it's a Carnival of Souls.